Do you feel that iPhoto’s limited image editing is holding you back? What do you do if you're a company that has developed a whole range of well-regarded, one-trick, photo-editing packages? Why, you sit down with your marketing manager and work out how you can bundle different ones together in new, exciting and profitable ways. 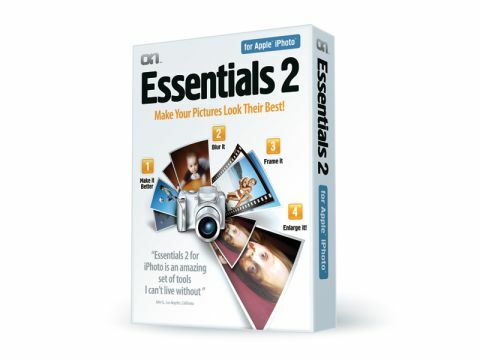 Welcome, then, to onOne Software Essentials 2 for Apple iPhoto, a bundle of some of onOne's titles aimed squarely at the consumer market. It differs very slightly from the Essentials 2 for Adobe Photoshop Elements, switching the Elements bundle's version of Mask Pro, Cut it out, for Blur it, a module based on the company's FocalPoint title. And this is very definitely a bundle rather than a coherent application or even a suite; the interfaces are very different on the four modules, not just in how they work but in how they look. The Frame it module feels old fashioned with its Photoshop 3-era palettes and clunky 1-bit icons. Despite these inconsistencies, however, this is a very compelling package, so let's take a closer look at each of the four modules. Make it Better features the ColorTune half of onOne's PhotoTune standalone plug-in. Though the name sounds bland and non-specific, it's actually a handy tool for giving your images a bit more punch and vibrancy. The best bit is that you don't have to know what settings to apply to correct your image; you're simply presented with two images and asked to click on whichever one looks best to you. At each stage you can adjust the strength of the effect being applied with a slider, and you can snapshot any stage to add to the final side-by-side comparison at the end of the process. In the final screen all the manual controls are revealed so you can do some last-minute fine-tuning to colour balance, saturation and more; you have the option at the start to jump directly to this screen if you think you know what you're doing. The controls aren't particularly intuitive and the layout doesn't add to the ease of use, but while Make it Better does nothing that you couldn't achieve with some slider tinkering on the Adjust palette, especially with the later versions of iPhoto, it's still a very easy way to give your photos more impact. Next up: Blur it, and the concept here is very simple. This module allows you to add a selective blur to an image, keeping the subject of the photo – a person's head, say – nice and crisp, but blurring the area around it to draw the viewer's eye to the image. This feels like the suite's newest addition, and the interface is smart and easy to use. Most of the variables – amount of blur, opacity of the central mask that can be lowered to create a soft-focus effect, feathering of the edge and more – can be adjusted with sliders at the right of the window, but the innovative FocusBug – a wireframe icon that sits on your photo – is a much faster system. There are two stalks whose length and angle affect different variables, but while this sounds complex it's in fact very easy to get to grips with. It's rewarding to use, too; the finished results are very pleasing. The blur area can be defined using an ellipse – great for baby pictures – or in a straight line, blurring the top/bottom or right/left of an image. This technique can simulate a photographic trick created using a tilt-shift lens that can make a top-down photo look like it's actually a shot of a model set, exploiting the mind's habit of translating a shallow depth of field on an image to that image being one of something very small. Then there's the venerable Frame it. The idea is laudable: rather than plonking some crisp, rectangular pictures down on a page, add a border to break up or enhance the edge. Many frames are included; there's everything from filmstrips to acid burns and Polaroid effects, and there's an engine that can create an effectively infinite variety of rectangular picture frame effects. There are, however, three problems. The first is that while the included library of frames is good, the finished result is a flat, rectangular graphic. So even if you have an analogue effect applied to your photo, you can only drop it on a white background to preserve that illusion; drop it on a coloured background and you get an ugly white box around your picture. Second, the engine that lets you add patterns and create rectangular frames from scratch – including material simulation, bevels, embosses and more – is littered with garish, mid-90s effects that look very dated. Worst of all, though, is that the interface isn't just old-fashioned but downright tricksy. Trying to work out the system of nesting effects, frames and borders is an exercise in frustration. Last in the bundle is the Enlarge it! module. Based on onOne's market-leading Genuine Fractals technology, the purpose of this title is to help you enlarge your photos so that, in theory at least, even snaps from a cameraphone can be blown up to A3 or larger and still look good. In practice, of course, it's not that simple. While the technology behind enlarging the images here is very impressive, there's no getting away from the fact that you can't create detail that's not in the photo to begin with. To be fair, Enlarge it! does do a very good job, and provided you're not trying silly enlargement factors, you should be content with the result. But the claim that it can "increase the size of your photos as much as 400% with no loss in quality", while technically accurate (you're not losing quality, but equally you're not adding any more), is misleading. Its inclusion in a bundle aimed at iPhoto makes sense, however, as there's no practical enlarging tool built into the latter. The Essentials 2 for Apple iPhoto bundle doesn't just work with iPhoto – indeed, the only link is that the installer changes iPhoto's external editor – so once it's installed you can use it with any image stored on your Mac. Help and support is commendable throughout, with short step-by-step tutorials provided for each module and even some full video training provided for, say, the Blur it FocusBug. Frame it may feel old and Enlarge it! may be more technically challenging than many iPhoto users are comfortable with, but this is still a great value bundle that adds lots of creative control to Apple's image organisation and editing app.